Welcome to Beachside Magnetic Island! 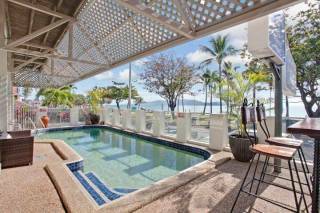 Beachside Magnetic Harbour Apartments is AAA Tourism accredited 4.5 star apartments on Magnetic Island. 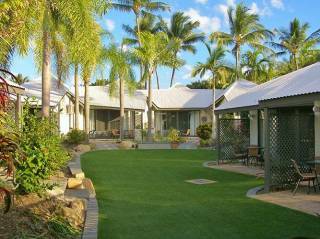 The self-contained accommodation on Magnetic Island located in Nelly Bay comes with full comforts of a luxury home. 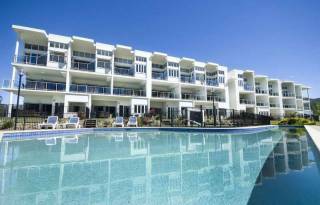 The 2 bedroom ocean view apartments offer great views over the harbour and Cleveland Bay. Light and airy, they capture the natural breezes and have a great outlook from the large courtyard or balconies. The bedding configurations are similar for all apartments - with a king bed in the master, 2 king single beds in the second bedroom (which can be converted to a queen on request), comfortably accommodating 4 guests. Magnetic Island is evolving into a must place to stay for an affordable and relaxing family holiday. With new accommodation becoming available, you have a choice of apartments on Magnetic Island that command spectacular water views across Nelly Bay Harbour and out to Cleveland Bay. Beachside Apartments offer all this and more. From the indoor/outdoor spa in all apartments, en-suites, to the granite bench tops in the kitchens, Beachside Apartments delivers a fit out with total focus on quality. In keeping with the tropical lifestyle, floor coverings for all ground floor, and first floor of the two story apartments, are cool designer ceramic tiles. The two story apartments also feature the natural look of timber, with a polished timber staircase and flooring on the second floor. From your master bedroom and en-suite spa, the expansive bi-fold doors open onto a large timber deck with superb sea and island views. Your kitchen is an astute combination of quality, style and practicality, designed for today's indoor outdoor lifestyle. Along with granite bench tops, the apartment offers European brand stainless steel oven, grill, ceramic hot plates and range hood, along with a double bowl stainless steel kitchen sink and designer chrome plated flick mix tap ware with filtered water. This is finished with ceramic tile splash backs and floors. Each kitchen opens directly onto the deck for outdoor dining pleasure. The bathrooms feature designer vanity tops, recessed ceramic basins, mirrors above the vanity and chrome plated fittings. The en-suite spa bath compliments the double/single ended showers. Your apartment also features a compact laundry with clothes dryer, a second bathroom with a bath tub (in selected apartments) and built-in wardrobes in all bedrooms. 1 Bedroom: King ensemble in the master bedroom. (Accommodates 2 guests). 2 Bedroom: a king ensemble in the master bedroom and 2 single zip ensembles to make a queen if necessary in the second bedroom. (Sleeps 4 guests). 3 Bedroom apartments: consists on a king ensemble in the master bedroom, 1 double bed to the second bedroom and 2 king singles to the third bedroom. (Sleeps 6 guests). Restaurants and shops are just metres away from the property and other services such as a Post Office and banking facilities are also located metres away from the property. 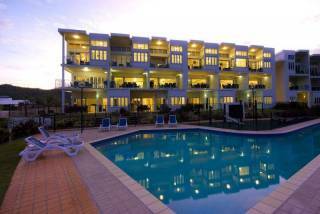 All room have Foxtel TV and internet access is available also. If arriving after 5.00 pm Monday to Friday or after 2.00 pm Saturday or Sunday please contact the Management at Beachside Magnetic Harbour to make arrangements for access to your Apartment. The phone number is listed on your booking confirmation. Car Parking is provided on site and is under cover. Each Apartment has been allotted one car park. Visitors Car Park is also available on site and is undercover. 1. With telephone or postal bookings, the description of the premises by the Owner/Manager is made in good faith but no responsibility for misdescription can be accepted. 2. This deposit is accepted on the basis of current conditions and may be subject to change should unforeseen circumstances i.e. fire, storm damage, change of ownership etc. prevent the original accommodation being available. Every effort will be made to offer alternative accommodation but Beachside Magnetic Harbour Apartments cannot be held responsible for actions taken by the owner, third party for any unforeseen event occurring beyond our control. 3. Where applicable, Body Corporate rules and regulations must be complied with. 4. This deposit is accepted on the basis that the rental quoted may be increased provided at least three months’ notice of such increase or cancellation is given to the person holding the booking prior to the arrival date. Upon receipt of written notice within 14 days that the increased rent is not acceptable, a full refund of the deposit will be made. 5. The guest/s will be responsible for damage to a premises or loss of or damage to any items in the premises, including but without limited the generality of the foregoing furniture, kitchen utensils, crockery, cutlery and fittings and the guest/s will within 7 days of a demand by the agent, pay to the agent at the address shown on the face of the receipt the cost of replacement or repair (at the discretion of the agent) of such items damaged or lost. 6. The guest/s will be responsible for the cost of any excess in cleaning costs incurred as a result of their occupation in the premises. 7. At no time during the occupancy of the premises shall more than the number of people indicated on the receipt, reside overnight. 8. The guest/s shall not park cars on the premises except in specific areas allowed for that purpose. 9. No responsibility is taken for guest/s personal property left on the premises. 10. Cancellations – A minimum cancellation fee of $75 is deducted from the deposit when a guest/s cancels a booking however, if a tenant cancels a booking less than 3 months before the reserved arrival date, the full deposit may be forfeited unless the Agent is able to rebook the property for the same period. 11. Pets are not permitted on the premises . Arriving by air - catch a taxi or the Airport Shuttle (when available) to the Breakwater Ferry Terminal. If arriving by Motor Vehicle you can use a Car Ferry to make the trip to the Island. Fantasea Cruising is located in Ross Street, South Townsville and can be easily accessed by using Palmer Street from the City or follow the signs to the City/Port if arriving from the South of Townsville. On arrival at the Nelly Bay Ferry Terminal proceed to the front of the Terminal to Sooning Street and turn left. Follow Sooning Street for approximately 300 metres and then left into The Cove. 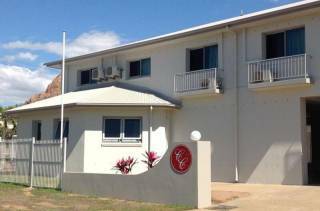 The Property is located on the Corner of Sooning Street & The Cove, Nelly Bay.